Equitas Entertainment is proud to announce the line-up for the upcoming Imprisoned Celebrity Benefit Screening hosted by Esai Morales and Lisa Vidal. Today, final preparations are in motion for the red carpet event taking place on Thursday, October 25th at the famed Egyptian Theatre in Hollywood, California. Imprisoned, produced by Equitas Entertainment and starring Laurence Fishburne (The Matrix), Juan Pablo Raba (Narcos), Juana Acosta (Velvet), Jon Huertas (This is Us), Esai Morales (How to Get Away with Murder), Edward James Olmos (Mayans MC), John Heard (Sopranos) and Ana Isabelle (Dementia 13), is set in Puerto Rico and centers on the themes of love, redemption, revenge and forgiveness. The benefit screening is a way of giving back to the island that welcomed the production with open arms a year ago last May. Imprisoned was the last film to complete principal photography before the devastation of hurricanes Irma and Maria hit the island. As a company, Equitas gave direct support immediately after the natural disasters hit Puerto Rico and now intends to use the film to raise capital for ongoing relief and raise awareness about the work that still needs to be done. The Imprisoned benefit event will kick-off with a star-studded red carpet and private reception for cast, sponsors and VIP’s. The evening will continue with an advanced screening of the film followed by the panel discussion moderated by Socio-Cultural Analyst, Dr. Donald Grant, “Making Social Change Through the Entertainment Lens” with filmmakers, cast, and social impact specialists. The evening will conclude with a Puerto Rican celebration complete with live music by Latin GRAMMY Nominee Oskar Cartaya featuring Angelo Pagan, spirits provided by Rums of Puerto Rico and light fare sponsored by Mofongos Puerto Rican Restaurant. Writer/Director/Producer Paul Kampf is determined to prove that Equitas Entertainment can do well and do good at the same time by approaching storytelling from a different perspective. The Imprisoned Benefit Screening is presented by Apertura Showcase, in association with the American Cinematheque, and Equitas Entertainment and sponsored by Paradigm Talent Agency, Kohler Co., H2O Worldwide, Inland Body & Paint Center, Rums of Puerto Rico, Mursuli Cigars, Mofongos, New York Cake Pops, Andes Wines and Latin Heat Entertainment. A portion of the proceeds from this event will benefit Puerto Ricans in Action, a fiscally sponsored 501c(3), to assist in their on-going recovery efforts. APERTURA Showcase and the American Cinematheque, or their programs, will not benefit from this screening. 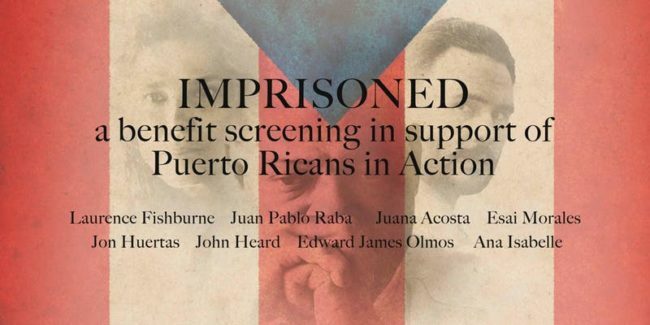 All, if any, tax benefits to sponsors and donors to this screening will be granted by Puerto Ricans in Action. Equitas Entertainment Partners is a film production company that produces compelling projects that provide opportunities for the underserved in the film industry, while also helping to promote equality in pay and female leadership. Equitas’ mission is to make films that make a powerful and positive social impact. Puerto Ricans in Action is a fiscally sponsored 501c(3) whose mission is to ensure the vibrant future of the Puerto Rican people by strengthening Puerto Rican identity, communities, and connection with Puerto Rico. PRiA aims to be the central organizer for the Puerto Rican community in Los Angeles and to ensure everyone on the island has access to clean drinking water.